Your card that represents you is the Ace of Cups and means that you are ready for new love. You have taken things slowly in finding new love and this is good. I feel you are very trusting in love and in new relationships and not just from what I know about you but what the reading is showing. The reading is saying that you may be getting swindled again which shows as the Fool card (reversed). Thought the chemistry between you both may be magnetizing, the reading shows that things are not clear thinking. You will need to think logically about this relationship. This may be someone that you may need to feed emotionally, and I do see that if a relationship is formed, their perspective of both of you is they may be at a higher level than you and may take advantage of their authority or power. I don’t know if it may be because of age that they may use that as a pull to you, but I do sense a tug of war that will go on. The reading doesn’t show a great match and shows no cards of any soul connection, rather maybe on the surface level or physical level. Please take in this information and see if it fits you. Sometimes this doesn’t mean you need to end it, but to see for yourself how the relationship pans out. 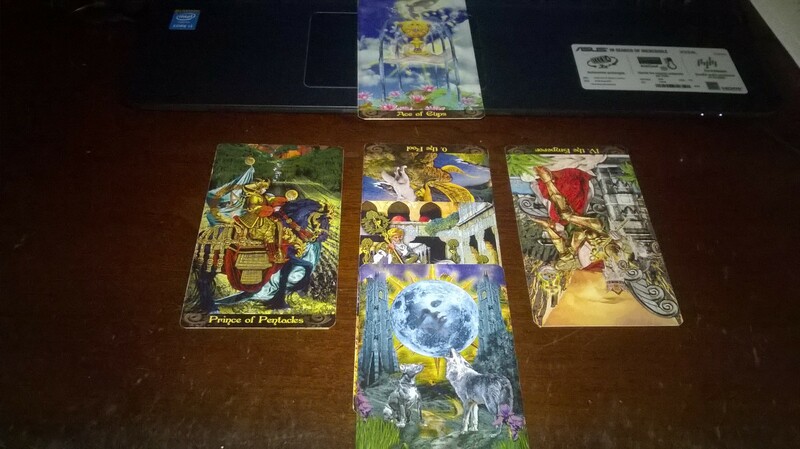 The reading says for you to be cautious and just notice red flags if they pop up. I hope this helps you get clarity in this potential relationship! I thank our guides for their help in these messages for you!